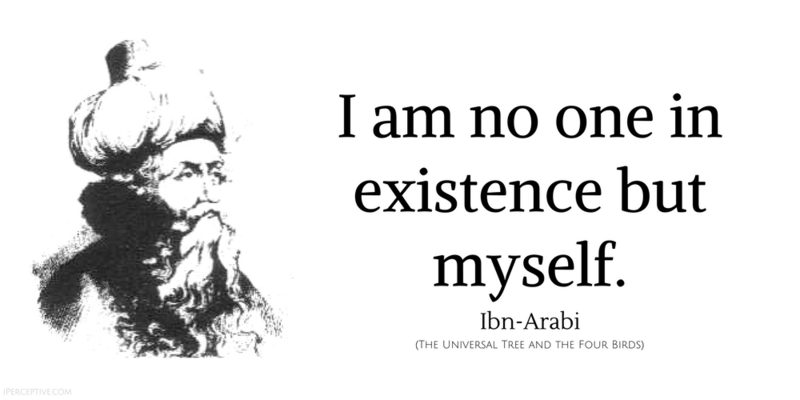 I am no one in existence but myself. How can the heart travel to God, when it is chained by its own desires? God sleeps in the rock, dreams in the plant, stirs in the animal, and awakens in man. 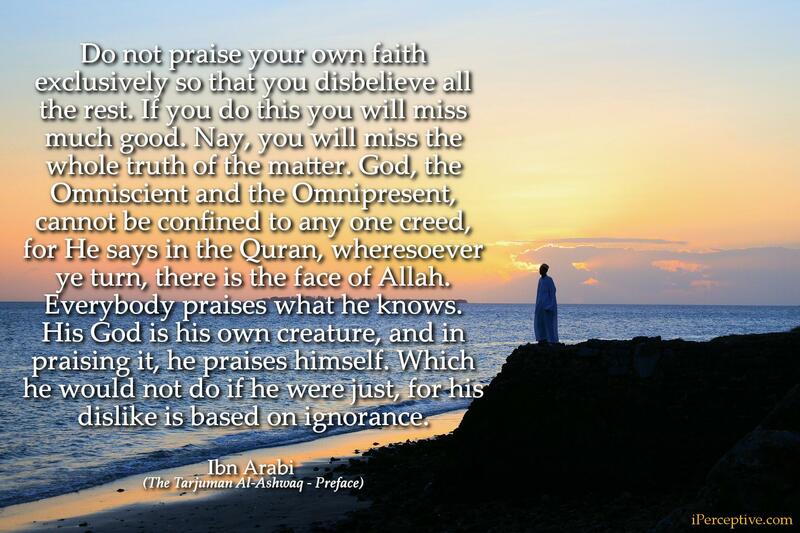 When you know yourself, your 'I'ness vanishes and you know that you and Allah are one and the same. I am in love with no other than myself, and my very separation is my union... I am my beloved and my lover; I am my knight and my maiden. If men knew themselves, they would know God; and if they really knew God, they would be satisfied with Him and would think of Him alone. When the mysterious unity between the soul and the Divine becomes clear, you will realize that you are none other than God. You will see all your actions as His actions; all your features as His features; all your breaths as His breath. Such knowledge can only be had by actual experience, nor can the reason of man define it, or arrive at any cognizance of it by deduction, just as one cannot, without experience, know the taste of honey, the bitterness of patience, the bliss of sexual union, love, passion, or desire. to His Creation, without separation. Whoever builds his faith exclusively on demonstrative proofs and deductive arguments, builds a faith on which it is impossible to rely. For he is affected by the negativities of constant objections. Certainty(al-yaqin) does not derive from the evidences of the mind but pours out from the depths of the heart. Beware of confining yourself to a particular belief and denying all else, for much good would elude you - indeed, the knowledge of reality would elude you. Be in yourself a matter for all forms of belief, for God is too vast and tremendous to be restricted to one belief rather than another. As for the theorists and thinkers, and the scholastic theologians, with their talk about the soul and its properties, none of them have grasped the Reality; such speculation can never grasp it. He who seeks to know the Reality through theoretical speculation is flogging a dead horse; ... for he who seeks to know It by any means other than the one proper to It, will never grasp It. O lover – whosoever you are – know that the veils between you and your beloved – whosoever he might be – are nothing save your halt with things, not the things themselves; as said by the one who hasn’t tasted the flavour of realties. You have halted with things because of the shortcoming of your perception; that is, lack of penetration, expressed as the veil; and the veil is nonexistence and nonexistence is nothingness. Thus there is no veil, If the veils were true, then who got veiled from you, you should also have been in veil from him. It is none other than He who progresses or journeys as you. There is nothing to be known but He; and since He is Being itself, He is therefore also the journeyer. There is no knower but He; so who are you? Know your true Reality. He is the essential self of all. But He conceals it by [the appearance of] otherness, which is "you." 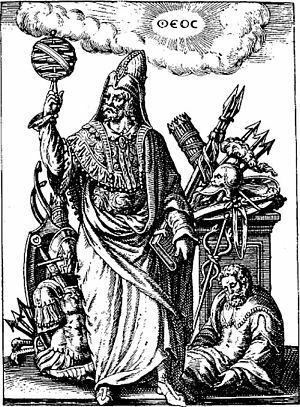 If you hold to multiplicity, you are with the world; and if you hold to the Unity, you are with the Truth .... Our names are but names for God; at the same time our individual selves are His shadow. He is at once our identity and not our identity ... Contemplate! 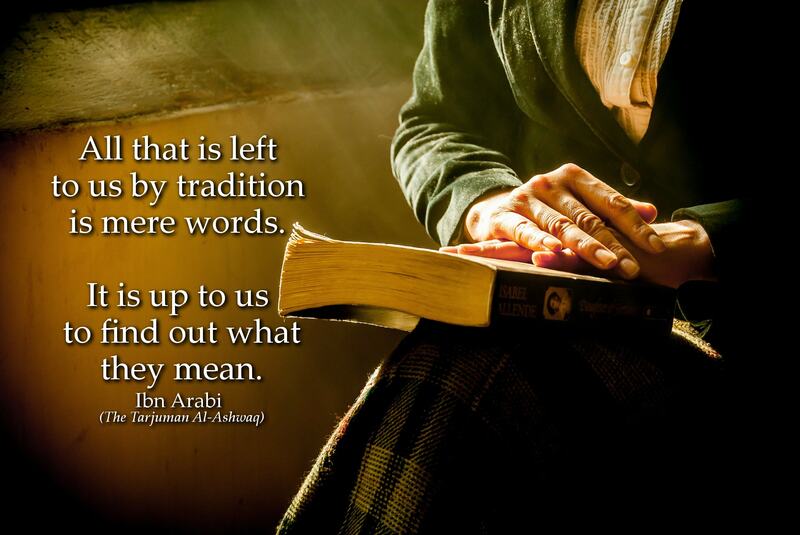 Your first duty is to search for the knowledge which establishes your ablution and prayer, your fasting and reverence. You are not obliged to seek out more than this. 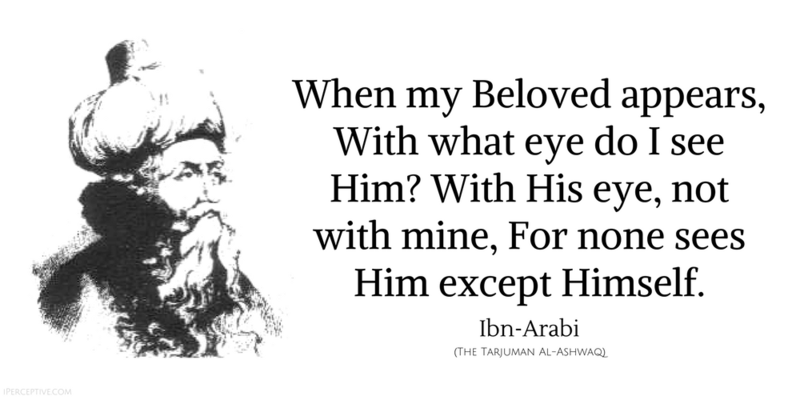 When my Beloved appears, With what eye do I see Him? With His eye, not with mine, For none sees Him except Himself. From my impossibility to my validity, and from my validity to my deficiency. 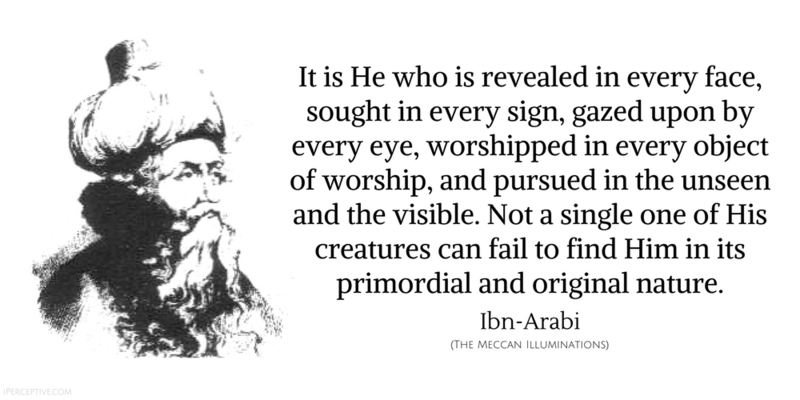 Ibn Arabi was a highly influential mystic poet and philosopher in the Sufi tradition of Islam. 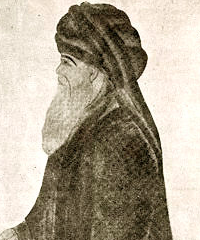 He is sometimes referred to as "the greatest master" by adherents of Sufism.